Best price available: Save when you purchase a full case of 12 bottles of Chef Tim's Sweet Balsamic Vinaigrette. 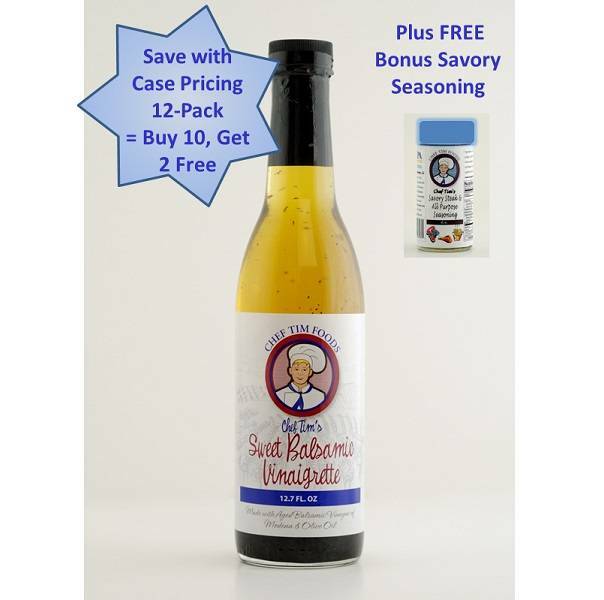 Buy 10, Get 2 Free PLUS a Free Bonus Savory All-Purpose Seasoning. 12 Small (12.7 oz) Bottles of our deliciously sweet balsamic vinaigrette made with aged balsamic vinegar or Modena and olive oil with accents of garlic and black pepper. Cholesterol Free and Gluten Free.